This Special Powdered Incense is formulated from 111 rare ingredients including carefully harvested Himalayan herbs, oils, resins and spices. Add a small pinch to your favourite incense mixture during spiritual ceremonies and meditation sessions to enhance your offerings to the Three Jewels. 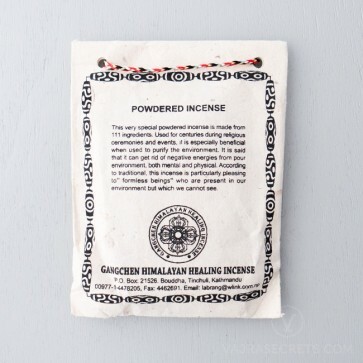 Our Special Powdered Incense has been carefully hand-made to meet the highest standards of quality, following a strict formula found in an ancient traditional text from a variety of medicinal herbs, oils, resins and spices from the Himalayan mountains. Prepared under the supervision of the eminent healing lama, H.E. Gangchen Rinpoche, this special incense powder contains 111 rare ingredients and is excellent for cleansing and purifying the environment of unwanted energies and to aid relaxation and stress-relief. It is particularly pleasing to "formless beings" who are unseen but present and co-exist in our environment. Buddhists also offer incense to purify what has been offered on the altar and to create the causes to have morality, ethics and hold one's vows well - virtues of the Bodhisattva spirit of selfless altruism to benefit others. Hence, it is strongly encouraged to offer the best incense (and by extension, the best offerings) that one can afford. Add a small pinch to your favourite incense mixture during spiritual ceremonies and meditation sessions to enhance your offerings to the Three Jewels. This natural incense powder is non-toxic and contains no narcotic or habit-forming ingredients. Environmentally-friendly and completely safe for inhalation. For the best experience, burn in a Tibetan-style incense burner.